Aloha! The Polynesian Resort has been a favorite amongst many guests since the 1980s. This Resort is absolutely stunning and perfect for any Disney World and island lover. Here are he top ten things we love about Disney’s Polynesian Resort. The Polynesian offers exquisite tropical décor in every nook and cranny of the resort. Enjoy deep woods with bright colorful flowers and island attributes. The décor will follow you from the parking lot to your resort room and all throughout the hotel. There is also a lot of lush greenery and beautiful waterfalls. The plants here are native to islands and the hibiscus flowers and orchid leis (made in the lobby) add a soft touch. You will truly feel like you have been whisked away to Paradise Island! Along with the lush and tropical décor come the stunning views. The north part of the resort faces Magic Kingdom. During the evening, guests can enjoy the fireworks and see Cinderella’s castle glowing in the distance. Just before the views of the Magic Kingdom are the stunning views of the Seven Seas Lagoon. The resort offers a sandy beach area, perfect for snagging a spot on the hammock and relaxing or just laying out with your toes in the sand. The views of the water, Magic Kingdom, beach, and resort itself are stunning and worth the stay. If you’re looking for some exotic cuisine and sweet treats, you’ve come to the right place. The Polynesian offers quick service and sit down restaurants that offer some of the most exotic menus in the entire Walt Disney World Property. Kona Kafe is a great place to unwind and enjoy breakfast or lunch. This restaurant also offers Tonga Toast, a favorite option amongst many Disney guests. Ohana’, another popular place to feast for breakfast and lunch, offers exquisite family style cuisine with character meet and greets and tons of fun for the whole family. You can even see the Wishes firework show from the wrap around windows here! Another loved restaurant is the Spirit of Aloha. Here, guests dine (all-you-can-eat style) while enjoying a luau with Polynesian dancers, drummers, and a fire-knife performer. No matter what restaurant you choose, you will definitely love dining at the Polynesian Resort! Planning on visiting the Magic Kingdom frequently on your trip? The Polynesian is one of the main Magic Kingdom resorts and is very close to the park itself. All you have to do is hop on the monorail and you are a small ride away from the happiest place on earth. There are also complimentary busses to take you to the other parks. If you want to explore other resorts, the monorail will also take you to the neighboring resorts; the Grand Floridian and the Contemporary. This is a great way to explore new dining options. The guest rooms at the Polynesian Resort are absolutely exquisite. The pale green tones with rich wooden furniture and island style lamps add a beautiful atmosphere for your stay. There are also some great views including the theme park and lagoon view. This is perfect to watch the evening fireworks and the boats sail along the lagoon. You can also enjoy watching the electrical parade on the water right from your window or balcony. The spirit of aloha is flowing within all of the guest rooms! There are a few pools to choose from to take a dip or get kissed by the sun, but the Lava pool has to be one of the most unique pools on property. Guests can enjoy views of a towering volcano while splashing around a zero-depth entry point (just like a beach). There is also a 142-foot long waterslide and refreshments and snacks near by. This is a beautiful pool to enjoy when you are vacationing at Walt Disney world. There is a lot more to do for recreation than just taking a dip in the pool. Guests can enjoy boat rentals, bike rentals, various sports, campfires, carriage rides, kid clubs, and golf. There is always something fun to do here! 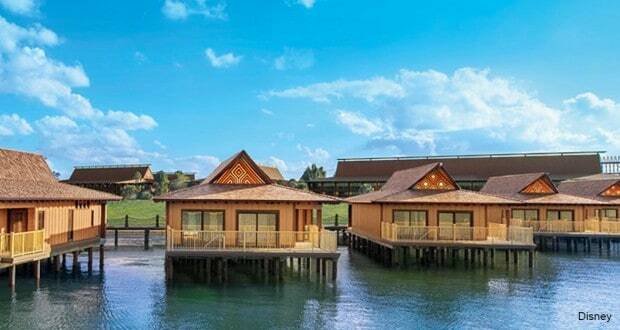 The newest addition at the Polynesian resort is the brand new Disney Vacation Club bungalows. These bungalows are held on stilts and actually sit on top of the Seven Seas Lagoon and they are incredibly luxurious. The bungalows are for up to 8 people and offer 2 bedrooms, 2 bathrooms, a kitchenette, private back deck, and a plunge pool. The wood flooring and distressed bronze metals coupled with island décor is the perfect getaway. The back deck even includes speakers that play the music that is played in the theme park during the Wishes firework display each evening. Can you imagine watching the show from your hot tub? You don’t have to be a DVC member to enjoy this! You can purchase points from a DVC member to kick back and relax in this blissful place. Every Disney Resort offers movies under the stars, but the benefit of watching it at the Polynesian is that it is at the Lava Pool. Not only do you get to relax and watch a Disney film under the stars, you also get a great view of the pool! The gift shop at the Polynesian has unique merchandise because it is themed like the islands. You wont find this type of merchandise anywhere else. If your home is decorated with an island feel, you will love the home décor items here. They have the perfect patterns with ultimate Disney flare. I also love how the characters on the mugs and picture frames are wearing Hawaiian attire! Natalie is an elementary school teacher and a native Floridian who lives and breathes all things Disney. Her love for Disney started at the age of two during her first visit, and has continued to flourish into her adult life. She loves to share her Disney passion with her students and believes Disney is so special because there is no other place to forget about your worries and be a kid again, which is why she refuses to ‘grow up’.